In a large glass or stainless-steel bowl, whisk together the vinegar, Dijon mustard, salt, and 1/4 teaspoon black pepper. Add the 1/3 cup oil slowly, whisking. Heat the broiler. Put the baguette slices on a baking sheet and brush the tops with the remaining 1 1/2 tablespoons oil. Broil until lightly browned, about 2 minutes. Remove the baking sheet from the oven. Turn the slices over and top each one with a slice of goat cheese. Broil until the cheese is soft and warm, about 2 minutes. Sprinkle a little pepper over each croûte. 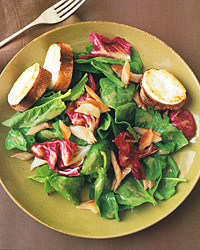 Meanwhile, toss the spinach and radicchio into the dressing. Put the salad on plates. Top with the trout and the goat-cheese croûtes. Use romaine lettuce instead of spinach. Add a handful of frisée to the spinach and radicchio. France's Chavignol is world renowned for both its Sancerre, made from Sauvignon Blanc, and its mouthwatering goat cheese. It's no accident that they are splendid together. Try a Sancerre here for the same delicious effect.